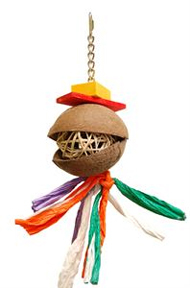 Kiki Coco is strung on nickel plated welded chain for durability ... has some colorful pieces of wood and two coconut halves with a much ball in the middle. Perfect for encouraging foraging and the coconut shell is long lasting. There is some colorful paper rope on the bottom for added texture and interest. Open up the rope and place a whole almost or treat inside and wrap it back up.